Later this week five nuclear weapon states will meet in Geneva for their now regular P5 meeting. The meeting is taking place right before the NPT PrepCom, which is also held in Geneva this year. One issue that will probably come up at the meeting is the transparency of nuclear arsenals. The five addressed transparency in the past, but the best they came up with was a working group that is supposed to develop a glossary of nuclear terms. This is, of course, a very useful product, but it is a rather small step as far as transparency is concerned. 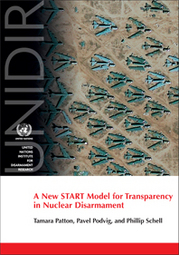 The P5 is widely expected to do more - one of the items in the action plan adopted by the 2010 NPT Review Conference encourages nuclear-weapon states to agree on a standard reporting form that would be used to provide information on their "systematic and progressive efforts to reduce nuclear weapons." The UN even created a web page where it will publish the information provided by the nuclear weapon states. The P5 states are expected to report on the progress they made on the disarmament front at the 2014 PrepCom, so there is some pressure on them (albeit not particularly strong) to get something done by then. Transparency seems like a good area where progress might be possible. There are a number of proposals designed to address transparency. For example, the Non-Proliferation and Disarmament Initiative, a group of ten non-nuclear weapon states, developed a fairly detailed reporting form that it submitted to the P-5 Paris meeting in 2011, only to be met with silence. There are other proposals as well, some of them asking for quite a bit of information - down to serial numbers of warheads and warhead production and dismantlement history going all the way back to the first nuclear devices. This, of course, would be nice to have, but we are probably a long way from the point when nuclear weapon states would be able to agree to release this kind of information. As someone described the P-5 discussions, "some states are more interested in transparency than others," which is a way of saying that some are probably not interested in it at all. Aside from the reluctance of states to make information about their nuclear arsenals public, there is a practical issue of defining what should be included in the report. For example, the NPDI form asks for things like "number of strategic or non-strategic deployed nuclear warheads," but to answer this kind of request one would need to agree on what is a warhead, when it is strategic and when it is not, and at what point a warhead is deployed. This are all good questions that would have to be answered some day, but at this point these questions just hold the process back. This is where it would make sense to turn to the experience of Russia and the United States who have been dealing with the issues of definitions and reporting for several decades as part of their arms control and disarmament talks. Even if you don't count the early treaties, the START agreement, which included very comprehensive reporting provisions, is more than 20 years old. The treaty that is currently in force, New START, also includes detailed data exchange among its many provisions. One particularly important element of the treaty is that it defines quite clearly what it is dealing with. For example, in New START the concept of a strategic deployed nuclear warhead has a fairly precise meaning - these warheads are counted and their number can be verified. Purists could say that New START definitions are not perfect, but in the end the treaty does give a reasonably good picture of the number of operationally deployed nuclear warheads in Russia and the United States (and that, by the way, includes all warheads, as there are few, if any, deployed non-strategic warheads). Overall, what New START provides is a well-developed and thoroughly tested data exchange mechanism that could be used as a starting point in the effort to bring universal transparency to nuclear disarmament. Last year UNIDIR launched a project that looked into the practicalities of this kind of data exchange and I'm glad to report that we are ready to present the results. The project has a dedicated web site NuclearForces.org that has all the links, maps, and Google Earth files that show where the bases and other facilities in China, France, Russia, United Kingdom, and the United States are. Please visit the site, read the report, and take a look at the model New START data exchange documents in the supplement. It is important to note that it reflects the status of forces on 1 September 2012 (the date of one of the most recent data exchanges) - the numbers would change somewhat if a different date is chosen. There are few surprises here, but a couple of things are worth highlighting. China would report zero deployed warheads as we assumed that no warheads are actually mounted on China's ballistic missiles. Under New START definition that means exactly that China has no warheads on deployed ICBMs or SLBMs (we assume that no SLBMs are deployed). China, however, has deployed ICBMs and also non-deployed launchers that provide a good sense of what the size of its nuclear force might be. Another interesting feature of this table is that the number of warheads deployed on U.K. SLBMs is fairly low - only 88. It is a result of the timing of the report - in September 2012 only two U.K. submarines had missiles on board, as Vengeance was in overhaul and Vigilant, which was emerging from overhaul, was in Kings Bay, waiting for her missiles to loaded. Go to NuclearForces.org and download the reports to see a more detailed discussion. The model data exchange reports provide more information about nuclear forces of all states. For example, it is clear that the U.S. practice to remove coordinates of missile silos and other facilities from the unclassified version of the report is a bit silly - it may have made sense in 1991, when this practice started, but now all that information is easily accesible on Google Earth. Russia could also release its report in full without problems - most of the contents can be easily reconstructed from the open data (as it turned out, internet forums where parents discuss military service of their sons has very much all you need to know and more - which missile regiments are active, how to get there, and what is the cell phone number of the regiment commander). France and the United Kingdom should be able to release their complete New START-type reports tomorrow - very much everything that would be included there is already open knowledge. In the U.K. case, even the unique IDs of the missiles that are on U.K. submarines are known to Russia, so there are no secrets there. The number of deployed warheads would be the only piece of information that is not available in the open, but it's hard to see why publishing this number would do any harm to either country. I don't think anyone really cares whether France has 200 or 288 deployed warheads. China, of course, is an outlier - it's difficult to get a good picture of where its bases and facilities are. But not entirely impossible. Also, as I understand, with all the skepticism about openness, China might be looking for ways to do something about transparency of its nuclear forces. Releasing a New START-type report, maybe limited to aggregate numbers at first, could be a step in that direction. Then, in a detailed report China would have to release information about its non-deployed missiles - a good way to put to rest the speculations about tunnels with thousands of missiles in them. The results of our project show that New START does indeed provide a practical way of bringing transparency to the nuclear disarmament process. It is, of course, just a starting point, but it has the advantage of having two states with decades of experience and a very elaborate legal and institutional framework behind it. Before I conclude, I must say that I am very glad I had Tamara Patton and Phillip Schell as my collaborators - SIPRI is very lucky to have them. For those of you who are in Geneva next week, we will present our report to the PrepCom on Tuesday, April 23rd, 13:15-14:45 at Room XI of the Palais des Nations. If you couldn't come, visit the project web site, NuclearForces.org, look at the data, and download the report and the documents to see how New START would work in practice. I think it would do pretty well.